Hot on the heels of new exercise classes such as zumba and hula-hooping, I’m going to start my own fitness craze – horse-ercise. I’ve always known that horse riding is good for you, and offers a range of mental and physical health benefits ranging from low impact exercise to de-stressing. Until now, however, I’ve never really appreciated just how good for you looking after horses on a day-to-day basis can be. Wearing the armband to groom Blue. Last week, for a magazine article, I was asked to wear an activity monitor for seven days. The point was to monitor my weekly exercise routine with my dog, Monty, to see how many calories I could expect to burn during a typical week’s dog walking. As I was wearing the monitor 24/7, I also ended up monitoring, by default, all my riding and stable chores, and the results were surprising. Here’s how I got on. To give you an idea, during half an hour’s brisk walking with Monty I burnt 140 calories on average; a half-hour run burned around 200. 1 hour 20 general stable jobs – turning out, skipping out, sweeping up etc – 334 calories. On Sundays, we have a yard rota and this Sunday was my turn. I turned out eight horses, then skipped out, watered and filled nets for four. The activity monitor was kindly on loan from Ki Performance. As well as monitoring calorie burn, it also measured the number of steps taken, sleep quality, and exercise quantity and intensity. It was around the size of a large wristwatch, fitted comfortably and securely and I soon forgot it was there. Every so often, I downloaded my data to a computer, and retrieved my results which were automatically calculated and presented for me. Image courtesy of Ki Performance. 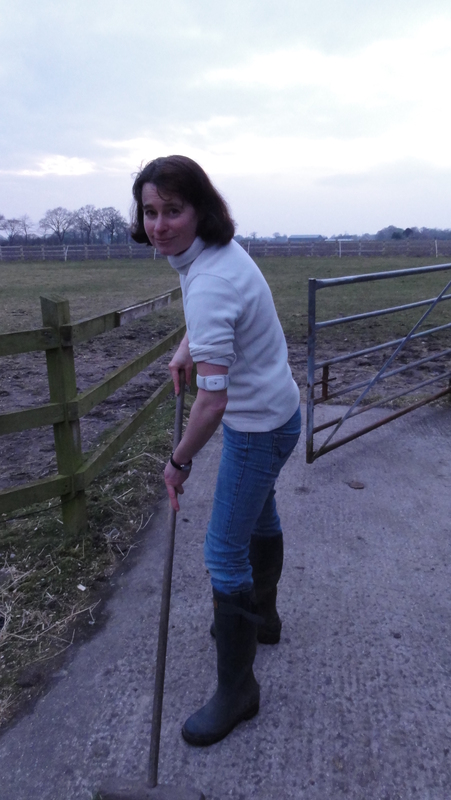 While some of the results were expected – poo picking, for example, consisting of a brisk walk with a loaded wheelbarrow, came out as a little more intensive than plain walking – some were very surprising. I couldn’t believe that an hour’s hack at walk would burn 250 calories, which is only a little less than if I’d walked an hour on my own feet. The experts at Ki Performance, though, confirmed that my results were trustworthy. 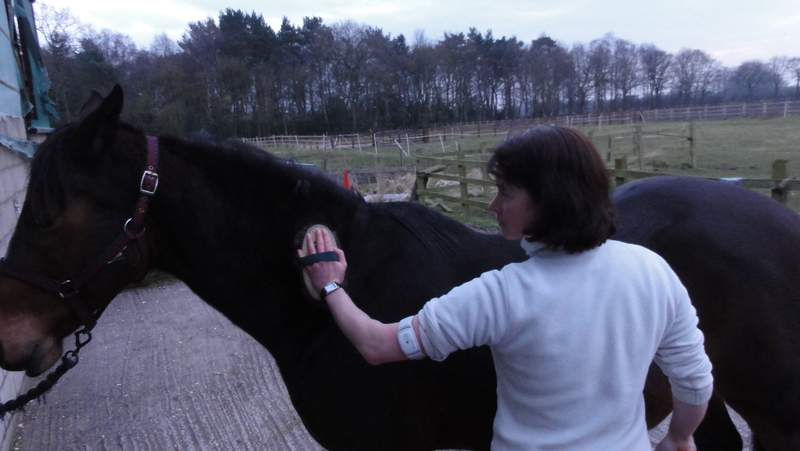 Although the monitor’s step counter may have been confused by the fact that I was on a horse, the calorie count would still have been accurate, as it was measuring my readings such as skin temperature and pulse rate to calculate a result. As I’m reasonably riding fit, I never feel that an hour’s hack is particularly energetic – but it’s obviously harder exercise that I thought. Also, the stable chores are exercise I have to do every day, rain or shine – whereas I know I’d never keep up a regular visit to the gym. So, buy into the benefits of horse-ercise – even if you have a retired horse that’s no longer rideable, leading him out for half an hour, trying a horse agility session or just giving him a thorough grooming every day will benefit you both, and could be better exercise than you think. The Ki Fit armband automatically captures your individual metabolic profile by collecting 5000 data points per minute, including calorie burn, amount and intensity of physical activity, and number of steps taken. Prices start at £99.99 plus a monthly subscription fee; available from Ki Performance.